Heh. Harry Potter. Not gonna read it. Giblets gave away the ending. OK, Giblets was maybe fibbing. But here's the truth: Panzanella. 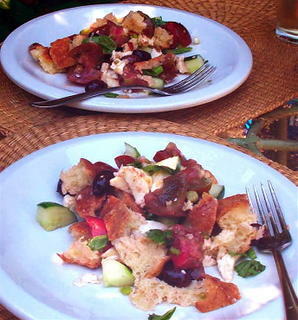 Tuscan bread salad. Tear up a hunk a' rustic bread (probably not the whole loaf; I've been cooking for two for so long I don't really know how to make larger quantities). Cut up some rather juicy tomatoes. These are Black Prince, fresh off the patio vine. Chop up a little onion (we used a scallion). Hack a cucumber into chunks. Carve a bit of fresh mozzarella into morsels. Rip a couple of basil leaves into pretty pieces. Get a few Trader Joe's pitted kalamata olives. Toss all the preceding (well, don't include the Giblets) in a bowl with olive oil, a judicious (i.e., measly) amount of good vinegar, sea salt and cracked black pepper. Let it sit for a few minutes while you open the Two Buck Chuck. My blog is here. My database is totally corrupted and the photos are gone and I haven't posted much over the last few months, but I write a bit about food. I'm starting something new this fall. Yeah, you got a little problem over at your blog. I can't wait to see what more you're going to do. Thanks so much for dropping by... How did you even find me? Hm. Illinois. My mom was born in Centralia! Preserving--jam? Peach butter? Tell me! Oh that salad sounds yum. Just one tiny problem--no tomatoes in my garden yet! So sad, as everyone in other places has them already, but we had weird weather and I was way behind anyway starting my seeds. I actually BOUGHT tomatoes last week. I won't say anything further. Congratulations on the success of your patio garden. Love that you are putting so much effort into it. I overdid it on the salad-as-entree dinners awhile back and my family revolted. I stopped making them for a awhile, but the Salade Nicoise from last weekend and this Panzanella have gotten me craving them again. Amy: How lucky is it that both humans in my house love to eat salad!!? And the "he" in the "we" loves making them. He's capable of much more artistic strewing, in my opinion. Daily Kos, m'dear, Daily Kos. I'm freezing peaches and blueberries and drying herbs and grating/blanching zucchini for the freezer. If I can get enough cukes I'll make pickles. And then there are tomatoes, 20 plants' worth. Considering I was an indie-rock chick when we moved here 9 years ago, completely unable to tell the difference between a tomato plant and a basil plant, I've come a long way. Lisa: Woo-hoo! Glad to have you. But seriously, 20 tomato plants? Do you have tattoos of zucchini on your calves? No tats anywhere, I'm afraid, but you've given me an idea.